During the past few years, I've grown fond of reusable shopping bags. Not just for shopping, but also for traveling, picnics or family gatherings. They can hold so much more than most tradition bags and they are typically pretty sturdy. I'm glad that lots of retailers hand them out for free, but they aren't always attractive. And sometimes I don't want to carry around a bag with a giant logo from some shop. 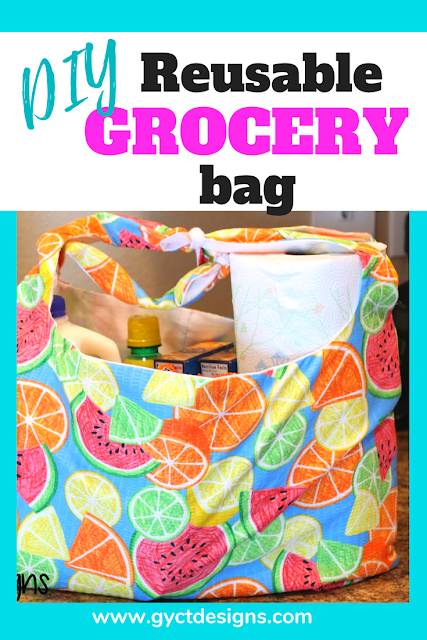 That is why I am excited to share a super fast and free Reusable Shopping Bag Pattern. I am going to admit something a little strange, but I love grocery shopping. Is that weird? It has always been one of my favorite "chores" and has been since I was a little girl. I use to love going to the grocery store with my Mom. I got to hold the coupons and make sure she didn't miss anything. I loved filling the shopping bags and helping her load and unload the groceries. My love for grocery shopping grew when I taught high school Nutrition and Foods. Each week I head to the grocery store with my list and shopped the deals and purchased the products for my students. I was a real perk for me. Now as a full time mom, I still really enjoy grocery shopping. I love cutting the coupons, looking at the ads, making my list and going to the store. I love it because I enjoy planning my menu, costing out recipes and making my grocery list. It saves me time, money and extra effort at 6pm when I'm trying to figure out dinner. And since I love shopping, I need good reusable grocery bags. I grab them on my way out the door and I'm set. Now that I have this shopping bag pattern, I can make several bags to take with me. I can even "color code" my bags so I know what purchases I have in each for easy loading and unloading. Let's get started sewing. You'll need just a few things to get started on your shopping bag pattern. Print out the Reusable Shopping Bag Pattern. Fold your main fabric in half and then in half again. Place the pattern on the folded side of the fabric. Pin in place and cut the pattern out. Repeat with the lining fabric. Place main fabric piece with right sides together. Pin across the bottom edge (that is the straight side). Then stitch a straight line across the bottom edge. Press your seams open. Repeat with lining fabric. Open up your main fabric and lining pieces and place them with right sides together (like picture below). Pin main fabric to lining. Stitch the main fabric and lining together all the way around. Leave a 3 inch opening on one side so you can turn your bag. Clip around the curved edges of the shopping bag. This will allow the curves to lay nice and flat. Using the 3 inch opening your left, turn your bag right side out. Carefully topstitch around the entire bag. This will also close your opening. Fold your bag in half, matching the front and the back of the bags main fabric. Stitch from just below the shoulder straps down to the bottom edge of the bag. Make sure to backstitch. You might stitch a second stitch just to add more strength. Take your front two ties and tie them in a knot. Repeat with the back ties. Congratulations! You have your own cute, functional and large reusable shopping bag. Now go put together a great grocery list and get shopping. If you need help with that, check download our free Printable Grocery List . 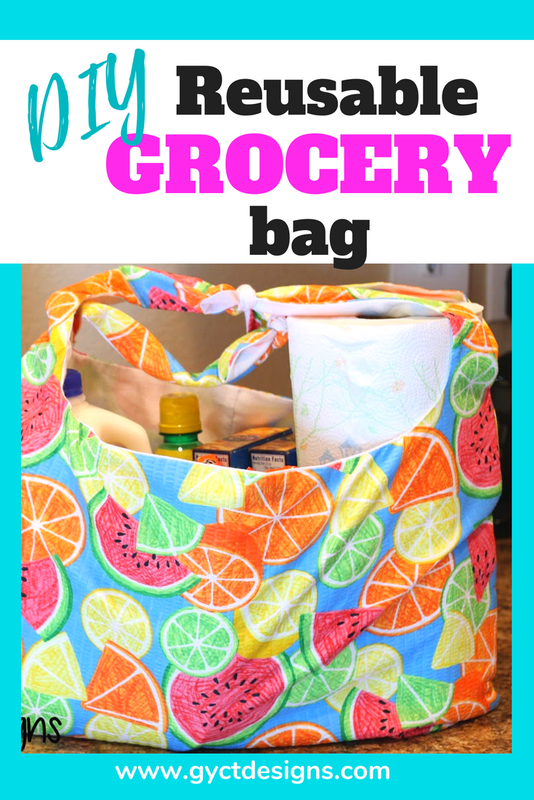 Don't forget to make several versions of the reusable shopping bag pattern so that you can carry all those delicious groceries.